FAQs > Campaigns > How do I set up a resource A/B test to split up my user base? How do I set up a resource A/B test to split up my user base? Marketers can employ the A/B test Resources tool to split their user group in half (or thirds, quarters, and so forth), and use those segments in different campaigns. These steps will allow you to A/B test separate campaigns while ensuring that users are not being exposed to more than one. Create a new resource that represents the variable you want to A/B test. 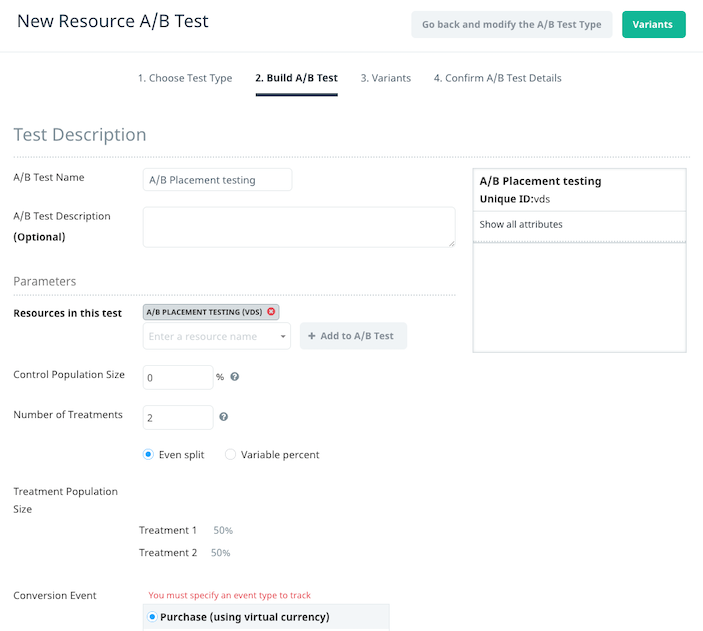 Run an A/B test on the new resource and determine the percentage of your audience you want exposed to each variant. Create in-app message or push notification campaigns for each variant and then monitor the A/B test performance. Step 1: On the Optimization menu, select Resources. Step 2: On the Resources screen, select + New Resource. Resource name – the name of the resource you wish to create; for example, Pages. Resource UID – enter a unique identifier for the resource. Thumbnail URL – optionally, to add an icon for the resource, specify a URL that points to an image. Step 4: To save the resource, select Make Resource. Step 1: On the Optimization menu, select Resource A/B testing. Step 2: On the Resource A/B Testing screen, in the Enter a resource name box, enter and select the resource you created in the previous section from the list. Step 3: To create a new A/B test using the resource, select +New Resource A/B Test. Step 4: On the Choose Test Type screen of the wizard, select the test type and then select Build A/B Test to proceed. Conversion Test – select this option if you want to compare variants based on the proportion of users who send a given event (the conversion event). In conversion tests, each user can contribute at most once to the success of that variant. Engagement Test – select this option if you want to compare variants based on the total number of times users have sent an event (the counting event). For examples of the application of engagement tests, see Intro to resource A/B testing. A/B Test Name – enter a name for the A/B test; for example, A/B Placement Testing. In the Number of Treatments box, enter 2. Note: This number of treatments value is in addition to the control. So, if you enter “2” treatments in the box, you will have a total of three treatments. In the Control Population Size box, enter 0. Depending on your preference or goal, select the Conversion Event. Step 6: After you have completed the Test Description, select Variants to proceed. Step 7: The control variant displays by default. Leave the Name of Variant as Control, and select Define Treatment 1. Step 8: In the Name of Variant box, enter the name of the variant you want to test (for example, you could enter the location of the trigger as [input_name_first_variant]). Then select Define Treatment 2, and repeat the process. Step 9: On the Confirm A/B Test Details screen, confirm the Variants in the test have the correct user breakdown, as illustrated below. If everything looks okay, select Create A/B Test.